Not a location that would normally have been top of our list of places to visit as the vision of Lake Garda was something like Amalfi Coast – people flock there because it is beautiful or at least once was before people flocked there. 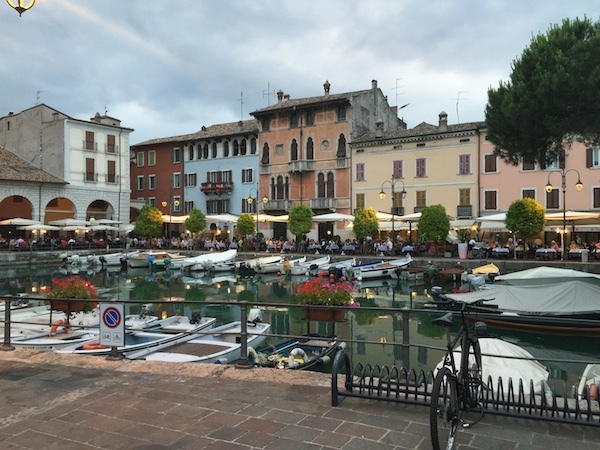 But the want to catch up with a friend staying there motivated us to grit our teeth and enter the foray of the most popular of the Italian Lakes and it’s busiest town of Desenzano del Gardo. The scenery was absolutely stunning with the serene lake backed by the layers of lush green hills and amazingly, the tourist hustle that we expected was nowhere to be seen. The children’s merry-go-rounds stood idle and the parks empty. The numerous bars around the piazza next to the harbour had a nice buzz about them and plenty of seats in the sunshine with views to the lake and to the renaissance buildings surrounding. A great espresso Doppio in the sunshine got me ready for the task of finding a campsite for the night. Tourist information told us that there was ‘Campeggio due kilometre da qui e questa sera siamo concerta de musica in la piazza’ or something like that in Italian but you get the idea. The campsite was almost empty and right on the lake with views out to the hills beyond and was indeed just a 20 minute walk back to town. A planned ‘quick beer’ with our friend turned into a lovely relaxed three hours and several beers. It was so nice to spend time chatting with like-minded people, talking of great experiences past and plans and dreams to come. As the sun began to set, we went our separate ways and Adam and I wandered into the narrow streets away from the bustling harbour in search of something a little quieter and more authentic. 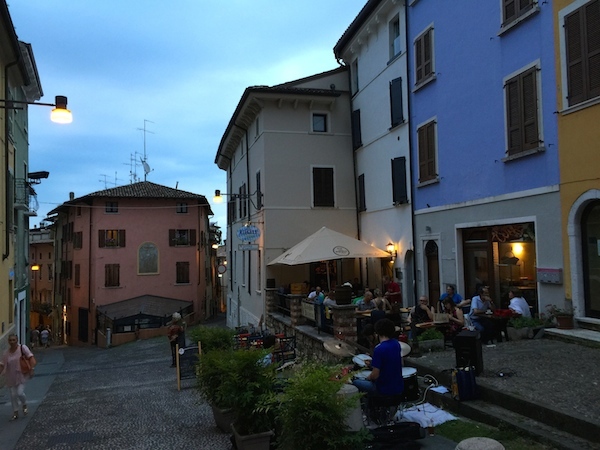 For once we came up trumps in the gamble that is travelling and found a little bar where Desenzano’s live summer music (only on a Wednesday) meant a live blues, jazz trio playing in the cobbled lane next to the bar. It was a joy to sit, relaxed in the corner, watching the characters effected by the music and feel like we had strayed off the beaten track and caught a glimpse of the locals Desenzano. A coppa de gelato topped the evening off nicely as we wobbled back and enjoyed the warm night air, along the seafront back to the van. 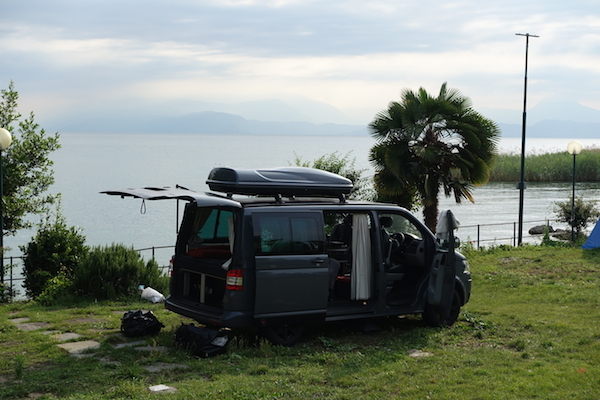 We woke early to the lapping waves and the lake fish feeding right in front of the van, the sun rising sleepily over the distant hills across the tranquil lake. ‘We’re getting there’ Adam said.